Only the Federal Government and the Lagos State Government accessed the Capital Market for bonds in 2017, a Fiscal Responsibility Commission (FRC) report says. According to its 2017 Annual Report and Audited Accounts made available to the News Agency of Nigeria (NAN), the Federal Government issued N1.66 trillion in bonds, while Lagos state issued bonds worth N97.39 billion. The report said that the Federal Government bonds accounted for N1.55 trillion of the amount borrowed from the capital market, Sukuk bond N100 billion, Savings bond N7.19 billion, while the Green bond stood at N10.69 billion. The report said that the Debt Management Office (DMO), did not expressly state the purpose of the bonds, it added that they were likely meant for the augmentation of the 2017 budget. 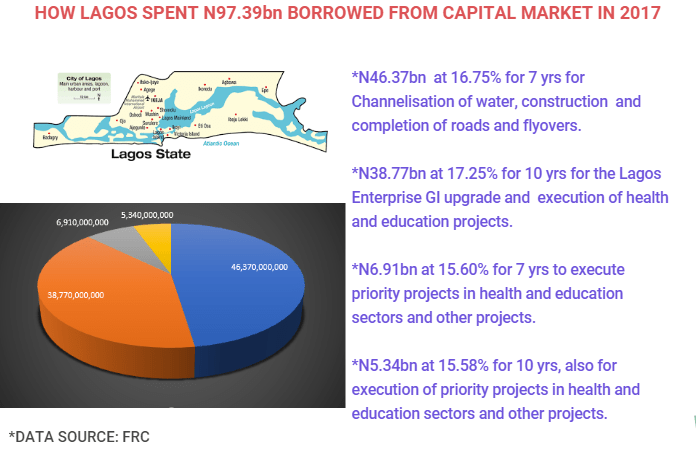 Giving a breakdown of the Lagos state instrument, N46.37 billion was raised at 16.75 per cent for a tenor of seven years for the channelisation of water, construction and completion of roads and flyovers. It said that N38.77 billion was issued at 17.25 per cent for a tenor of 10 years for the Lagos Enterprise GI upgrade to execute priority projects in the health and education sectors and the channelisation of water transport routes and completion of roads. Also, N6.91 billion was raised at 15.60 per cent for a seven-year tenor, while N5.34 billion was raised at 15.85 per cent for a 10-year tenor for the same purposes. According to the report, the borrowings complied with Sections 41 (1) (a) and 44 (2) of the Fiscal Responsibility Act (FRA) 2007. The act stipulates that borrowing by any government in the federation should be for capital expenditure and human development only.